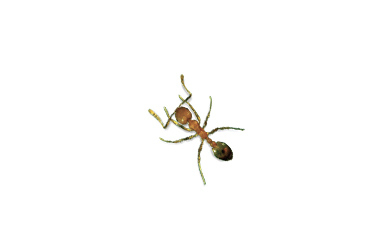 Pharaoh Ants tend to feed on sweets, proteins and insects. They forage in set trails along carpets, countertops, cabinets, and floors, favoring warm, moist locations in which to nest. Nests are usually found in wall voids, behind baseboards, in furniture, under floors and between linens. They commonly use electrical and telephone lines to travel through walls and between floors. Pharaoh Ants pose a major threat due to their ability to nest indoors in almost every area of a building. They’re thought to be able to transmit over a dozen pathogens, making their presence in sterile environments like hospitals extremely problematic. Sealing any exterior cracks or holes with caulking is helpful, but using a repellent could cause the colony to fracture and bud into several colonies; professional treatment is recommended.